On the 'Rate Plans' page you can create special offers and packages for discounted daily rates or to upsell other services as a package. Packages can be created for any period, including availability on specific days of the week and with minimum and maximum length of stay limitations. IMPORTANT: Rate plans created in myfrontdesk will only appear for direct reservations created within the system and online reservations through your property's website (mybookings) and Facebook booking engines. Rate plans and packages are not shared or synced with any OTAs or distribution channels. In order to create rate plan for a channel, please, contact your Channel Account Manager. 3. Enter Rate Plan name (Public): Rate Plan name that will be displayed upon creating a new reservation and on the Internet Booking Engine. 4. Enter Rate Plan name (Private): this is internal Name for the package that will not be displayed upon creating reservations and on the Internet Booking Engine. This is used to name rate plans differently if they all have similar names (ie Breakfast Included - August, Breakfast Included - September, etc). 5. Is this a derived Rate Plan? If you select 'Yes': derived rate plan is a percentage or amount higher or lower than the base rate (ie 10% higher than base rate, $15 lower than base rate). This is a perfect option in case you have fixed discount/price increase for specific conditions of stay, for example, -10% for all stays which are longer than 5 nights. If you select 'No': non-derived rate plan require you to enter package rates for each day of week within rate plan interval. 6. Promotion Code: If you would like this rate plan or package to show only when a promotion code is entered, select "Yes". This rate plan will only appear if the correct promotion code is entered. 9. 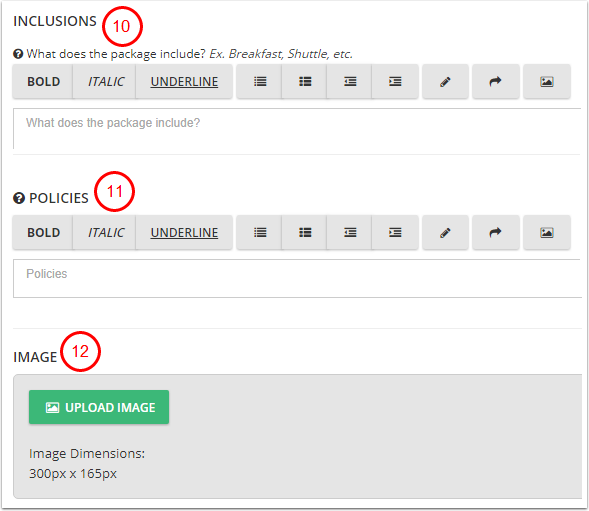 Select add-ons included in your package: select certain add-ons makes them be part of package rate. If room costs 100 per day with special offer and you add 'Breakfast' as add-on to the package, guest should pay 100 for both room and breakfast. 10. Inclusions: What does the package include? Ex. Breakfast, Shuttle, etc. MinLos: Minimum Length of Stay. Reservations will be refused unless the traveler agrees to create a reservation for the minimum number of nights specified. For example, with MinLos = 2, package will be available only if guest stays no less than 2 nights. MaxLos: Maximum Length of Stay. Reservations will be refused if the traveler attempts to create a reservation above the maximum number of nights specified. For example, with MaxLos = 5, package will be available only if guest stays no longer than 5 nights. Cut-off: The package will only be available to guests when they book a reservation at least these many days from the arrival date. For example, with a, Early Booking Cutoff of 30, a guest would only be able to book this package if their arrival date is at least 30 days from today. If the arrival date is less than 30 days from today, this package rate will not appear. Last Minute Booking: Last Minute Booking: this offer will become available for reservations made within this amount of days prior to guest arrival date. Also, guest departure date needs to be within the offer's date range. The customer has Last Minute rate plan with 1 day setting, this rate plan can appear only if number of days between arrival date and booking date less or equals to 1. 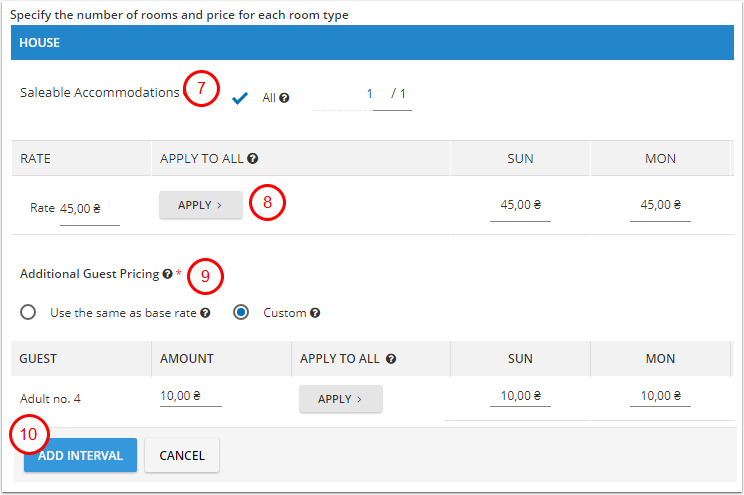 Example: If user has Last Minute rate plan with 1 day setting, this rate plan can appear only if number of days between arrival date and booking date less or equals to 1. Closed to Arrival: "Closed to Arrival" is used to prevent guests from arriving on specific dates within the range. This is particularly useful when combined with the other package restrictions. You may create different intervals to enable "Closed to Arrival". Closed to Departure: "Closed to Departure" is used to prevent guests from departure on specific dates within the range. This is particularly useful when combined with the other package restrictions. You may create different intervals to enable "Closed to Departure". 9. Additional Guest Pricing: If you charge an additional fee for adults or children not included in the rate, you can indicate the price of each additional adult and child below. -Use the same as base rate: If this option is selected, the same price for each additional adult and/or child set on base rates will be applied. -Custom: If selected, you can indicate a new price for each additional adult and/or child for this rate interval. You may add as many intervals as you wish by clicking 'Add Interval' (11) as well as edit or delete existing interval (12). 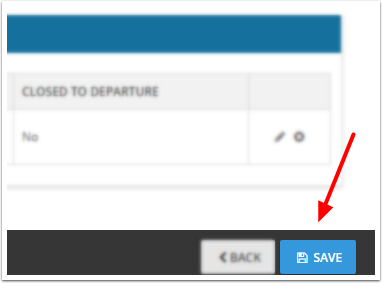 Promo code input field can help you to use discounts by entering promo code when creating a direct reservation.